This city slicker finally gets to eat a couple of raw pili nuts. Not from Bicol, but from Palawan. Everything I heard about raw pili nuts were true. Truly delicious, maybe nutritious? But awfully hard to open. I’ve tasted candied pili nuts many times. It is a product usually from the province of Bicol. But I have never tasted pili nuts raw. It is not sold raw in Metro Manila. When I see it in the delicacy stores they are always candied. It appears that these raw pili nuts have 2 shells. One hard dark purple shell that eventually rots and a second very hard seemingly ceramic wooden brown shell that is dangerously pointed sharp and slippery. 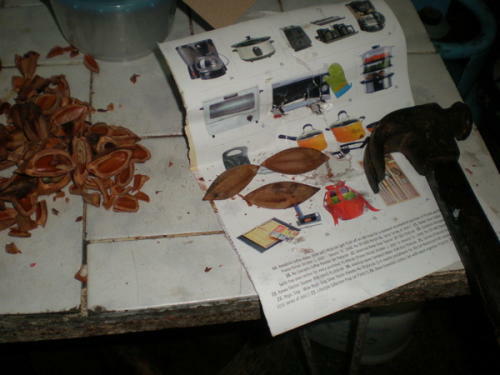 Difficult to open fresh pili nuts but not impossible. This is our technique: With a hammer, mash out the first dark purple covering. 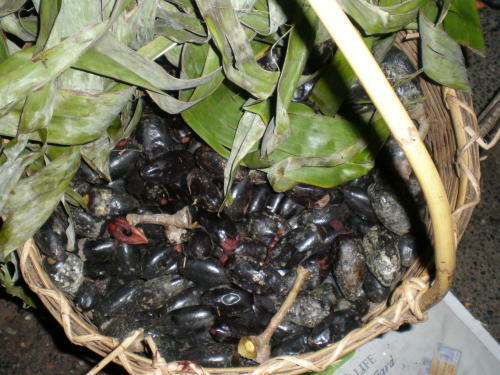 It will be squishy if the pili nut is very ripe. Then wash the slimy nut. Better to dry them in the sun so they are not so slippery. Get an old magazine or catalog, the thick kind. 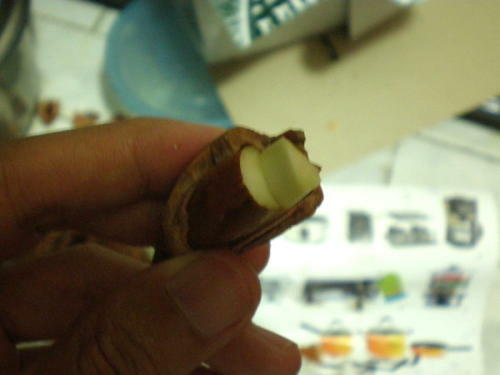 Wrap the pili nut to make sure both ends are trapped. 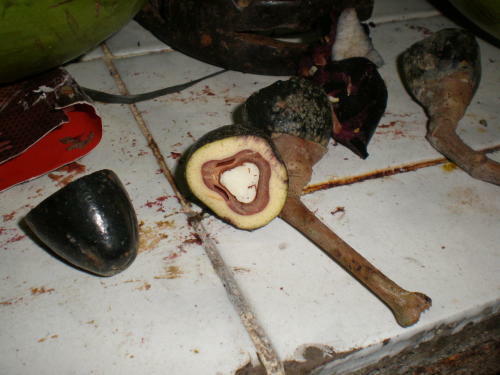 Hammer with just enough force to crack open the pili nut to access the delicious raw nut inside. If you hammer too strong, you wind up squishing the whole thing. Use a toothpick to be able to access the raw nut inside. Enjoy. I think nature made it pretty hard to be able to eat a lot of fresh nuts. From my fruitarian teachings it says nuts should comprise a small amount of your diet. I’m all tired after cracking open 10 nuts by myself. Of course if you had a maid like we do, you could abuse her and ask her to open dozens of nuts for you. That would be gluttony. My wife just brought home a second batch of pili nuts from Palawan today! Yummy! 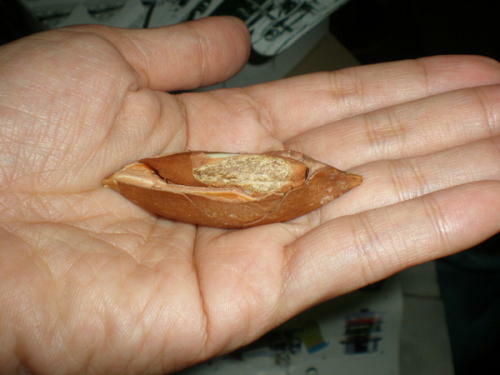 Any memories of where exactly you got the pili nut in Palawan? Would very much appreciate to find a source here.